This project explores access to private knowledge in public spaces via quick response bar-codes, commonly known as QR code. How might digital nomads conspire and collaborate using this portal to to the digital world? Whispered words are bounded in the space and time they are uttered, and written words are widely accessible in literate societies. Vagrants and nomads in the mid-19th century created a pictographic language, termed hobo sign, to convey functional messages with important in-group information about people and places such as safe and unsafe areas, places for work or leisure, and friendly or unfriendly neighbourhoods (Ponsler, 1972; Wanderer, 2002). Hobo sign was an in-group language meant to inform and protect group members, with simple visuals that were easily overlooked in the visual landscape (Ponsler, 1972). τέχνη, or techne, is the Greek root of the “technology,” meaning an art, skill or craft; a technique, principle, or method by which something is achieved or created (Bolter, 2001; Techne, n.d.). Hobo sign was a form of techne congruent with its time, purpose and place. Today, techne informs the digital language of QR codes to provide private, in-group knowledge in public spaces (Levin, 2011). QR codes in the urban landscape have quickly become a new type of iconography, remediating ambient space as a post-mechanical gate between the natural and digital worlds (Baik, 2012; Bolter, 2001). As a writing system, the data held within QR icons belies their compact form: in itself the icon may contain up to 7kB of information and may act as a direct hypertextual link to any online media (Baik, 2012; Shin et al., 2012). Free to generate using a variety of online services and readily decoded by devices such as Smartphones, QR codes constitute a fully exteriorized writing system (Bolter, 2001; Fleishman, 2010). As our relationship and interactions with our devices are becoming increasingly nuanced, QR icons provide a symbolic reminder of the hidden digital dimension beyond the curtain of the natural world (Shin et al., 2012). Beyond the code is a private space, inaccessible to the technologically disadvantaged and unnoticed by the uninformed. As we cannot read them with our naked eye, and as they have become almost inextricably linked to commercial campaigns, judicious use of QR codes can form a guerrilla breakout of hypertext, a “covert markup scheme for urban spaces” (Bolter, 2001; Levin, 2011). Subjective norms and behaviour towards QR codes as social media illustrate the dichotomies of public/private and interior/exterior, as bridged by the hardware in your pocket (Shin et al., 2012). The cultural ramifications of these developing social norms will only deepen as our knowledge and retrieval structures grow complicit with technological augmentation. Further removed from the visual noise of cities, the juxtaposition of their unique aesthetic in the rural visual landscape provides a strong symbolic reminder of the fluctuation and remediation of text technologies. Please follow this path to view my exploration of QR codes in urban and rural landscapes. All photographs are available at my Flickr photostream, where you will also find the meanings hidden within the QR codes that I generated and placed. Also, please note that the audio track must be activated by the volume icon in the lower right-hand corner (it will not automatically play). Bolter, J. D. (2001). Writing space: Computers, hypertext and the remediation of print [2nd edition]. Mahwah, NJ: Lawrence Erlbaum. Ponsler, M. (1972). Tell a story with hobo signs. Design, 74(2) 4-7. Shin, D.H., Jung, J., & Chang, B.H. (2012). 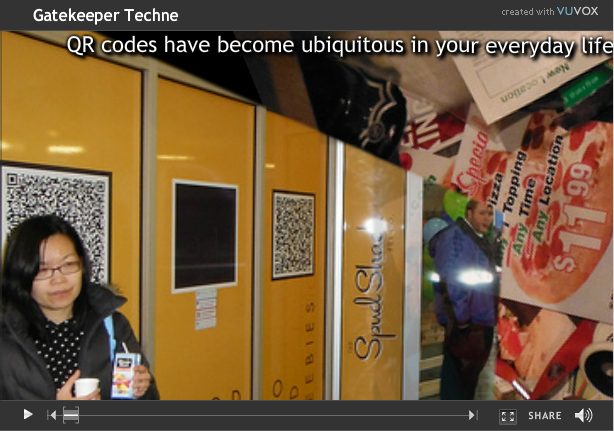 The psychology behind QR codes: User experience perspective. Computers in Human Behaviour, 28(2012) 1417-1426. Techne. (n.d.). In Oxford English Dictionary. Retrieved from http://dictionary.oed.com. Wanderer, J. J. (2002). Embodiments of bilateral asymmetry and ‘danger’ in hobo signs. Semiotica, (1/4), 211-223. This entry was posted in Major Project and tagged Gatekeeper techne, Major project, QR code. Bookmark the permalink. Brilliant presentation! I have actually never seen a Vuvox collage before and yours was a fine example of what this web 2.0 tool is able to do. I look forward to using it in the future! The spaces in which we exist are now mostly virtual – establishing an online presence is as important as the impression one makes in person. The QR codes exist completely in the virtual world and we tap into them using our devices, effectively removing ourselves from our physical worlds and delving into the virtual. Who knew that The Matrix movies were just ahead of their times, eh!? I spent quite a while searching for the “right” method to present my project. I had a vision in mind, and as I’m not what you would generally call an “artist,” I was worried that I wouldn’t find a tool that would correspond to what I was thinking. I was happy to come across Vuvox and upon some further research, surprised to find that the service has been around for years…. Since 2007 if I recall correctly, that is eons in internet time! It is a very powerful tool, and awesomely, it is free to use (and there are three modes of creation). I highly recommend trying it out. I think the topic of “cyborg” (modern/postmodern or not) is on many minds these days, even if the term “cyborg” has a sensationalist ring to it. When educators/parents/the general adult population look to youth who are transfixed with technology, what they are seeing is move towards increasing levels of technological augmentation. Right now many of these devices are separate from the body, but how long will that last? And what constitutes “separate”? Great presentation. This is something that companies and individuals are using more and more. I have a QR reader on my phone and when taking tours, or shopping I scan to get more information. I have heard of people using them in the classroom, but I have not tried creating my own yet. Thanks for this great resource. I had the opportunity to speak with a person who owns a QR code marketing company (http://contesmo.com/) and it was a fascinating discussion. From what I’ve heard it’s been a difficult sell in North America, where it is still not normative practice to scan QR codes unless there are some heavy incentives (ie, rewards by way of free entry, coupons, etc), but in the Asian market it’s quite a normal activity to scan the codes “in the wild.” I’ve also heard of the codes being used in the classroom, and in this project came across much literature relating to using them in libraries and museums. I think they have much unexplored potential yet – the Baik (2012) reading really spoke to this aspect of the QR code phenomena.